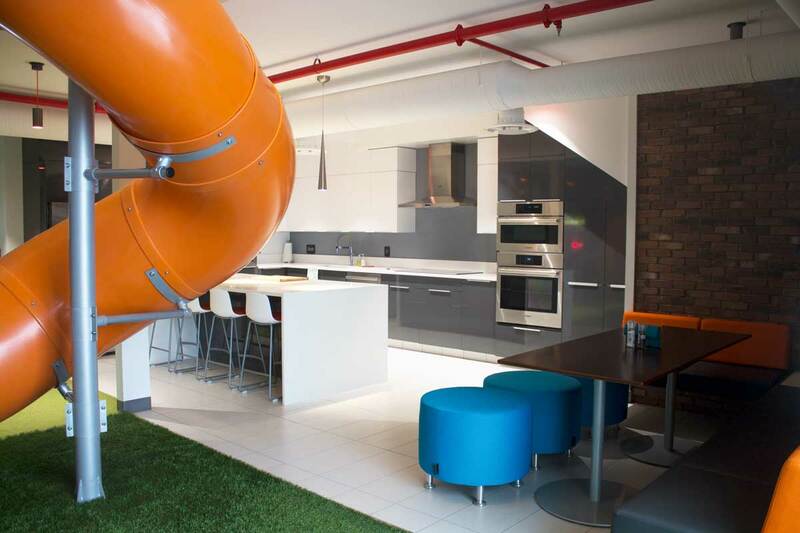 This office is a fun, colourful space complete with a big orange slide, arcade games and a Silicon Valley-inspired mural. When Myntex was preparing to move its operations from Canmore to Calgary, they knew they didn’t want to end up in a typical office space. So, the company, which offers what co-founder and CEO Geoff Green describes as “encrypted communication services for privacy conscious consumers,” decided to look to some of the biggest start-ups and businesses out there for inspiration. The team compiled photos of the offices of Zendesk, Netflix, Google and many more into an inspiration book to show prospective designer and architects what they had in mind. 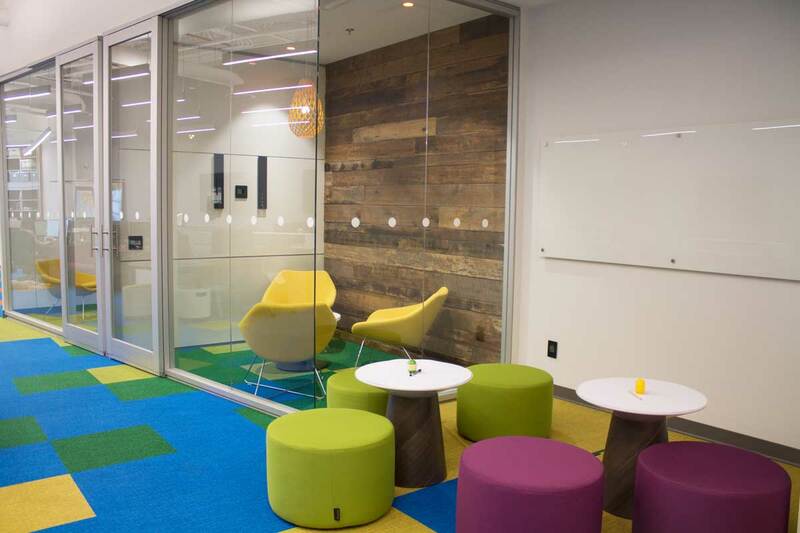 They wanted a relaxed, open space that wasn’t stuffy, and ultimately, it had to be a fun space to work in as well. After four years of searching and renovations, Myntex moved into its new Calgary office space in 2016 — and it’s fair to say that they achieved their goal. 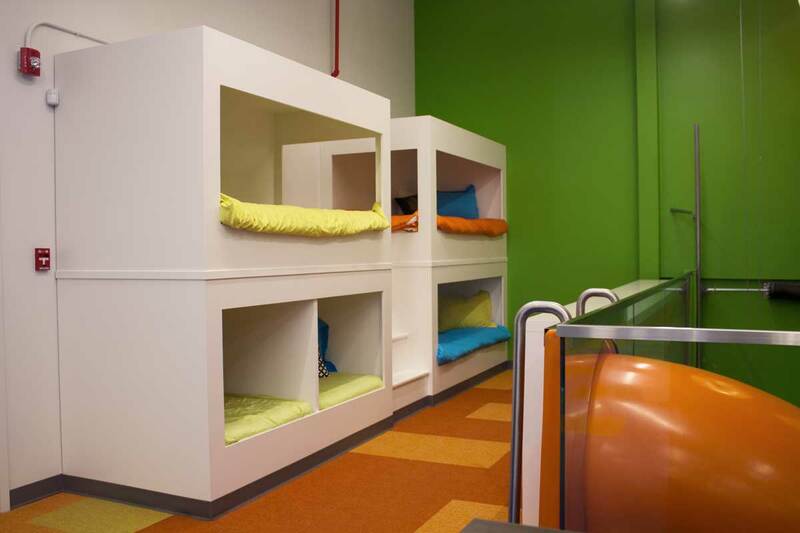 While there are classic office elements like desks, meeting rooms and a data centre, Myntex’s colourful, dog-friendly space also has tons of fun and creative features like a big orange slide, bunk beds, arcade games, bean bag chairs, a fridge full of beer and pop, a 3D printer and more. Plus, with 5,000-square-feet of space, there’s enough room to eventually scale the company. 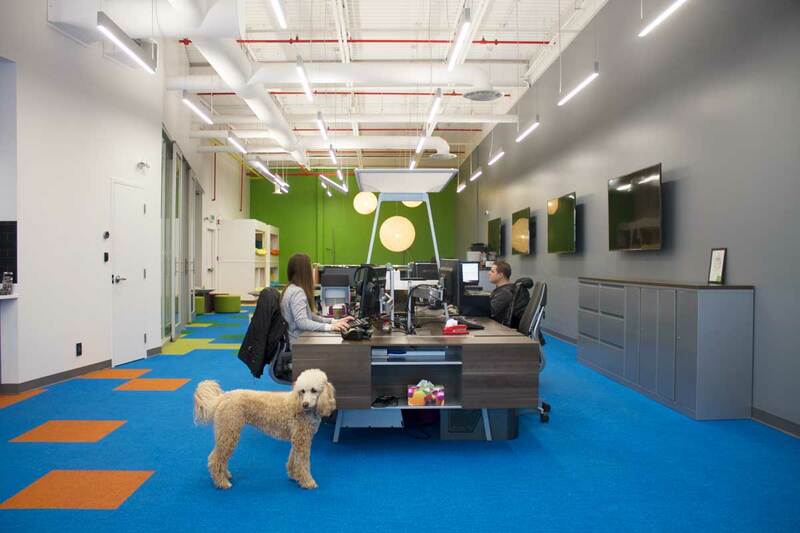 Now armed with an office that rivals some of the ones in their initial inspiration book, Green says most people’s first reaction to the space is “Wow, I want to work here.” Well, that or they ask if it’s a children’s or doggy daycare. But considering how unique it is to find an office space like this in Calgary, it’s easy to forgive the initial confusion. 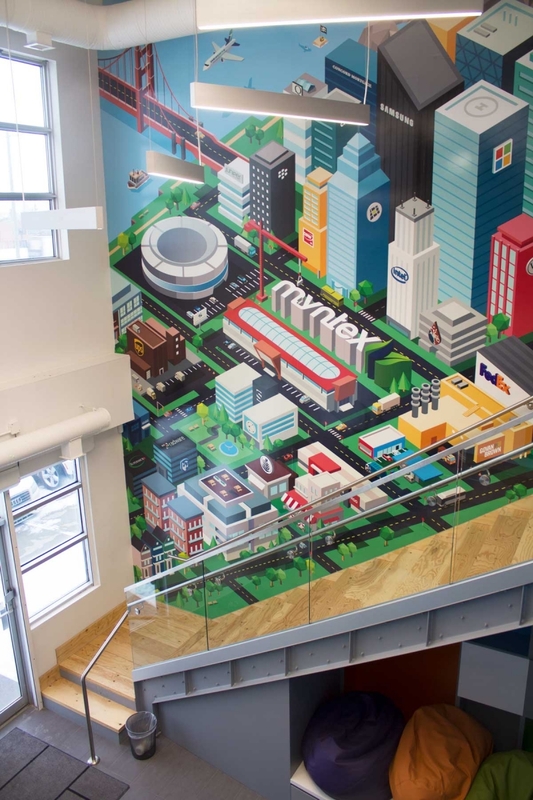 When you walk into Myntex, your eye is immediately drawn to this giant mural along the staircase. 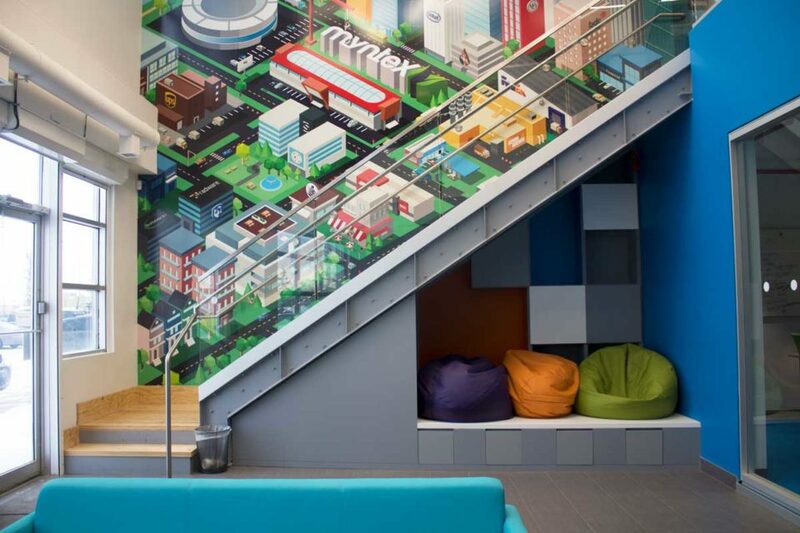 The mural was inspired by the animated title sequence from the TV series Silicon Valley and features services that Myntex uses, businesses they’ve worked with over the years and references to some of the staff’s family members and friends. There are also fun additions like Waldo from the Where’s Waldo books. “This is actually a tribute to everybody that helped us get to where we are today,” Green says. Photograph by Alana Willerton. Like a mullet hairstyle, Green says Myntex’s office is set up to be “more corporate in the front and then more fun in the back.” The front lobby is fairly traditional and leads to a board room and the company’s data centre. Photograph by Alana Willerton. Calgary design company 2Stone Designer Concrete created the large concrete table in the boardroom. A wall had to be taken out in order to get the individual table pieces in, then they were connected in the room. “Basically now that it’s here, you can’t move this thing unless you jackhammer it,” Green says. Photograph by Alana Willerton. Once you get to the back of the office, the fun beings. 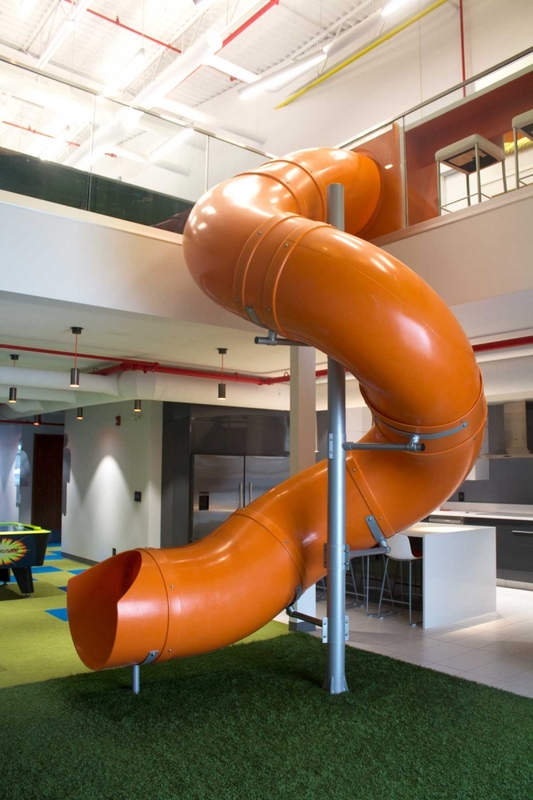 A giant orange slide snakes from the second floor down to a bed of AstroTurf flooring on the first, and the staff do end up using the slide on a regular basis. This corner also has a garage door that lets in lots of natural light. Photograph by Alana Willerton. 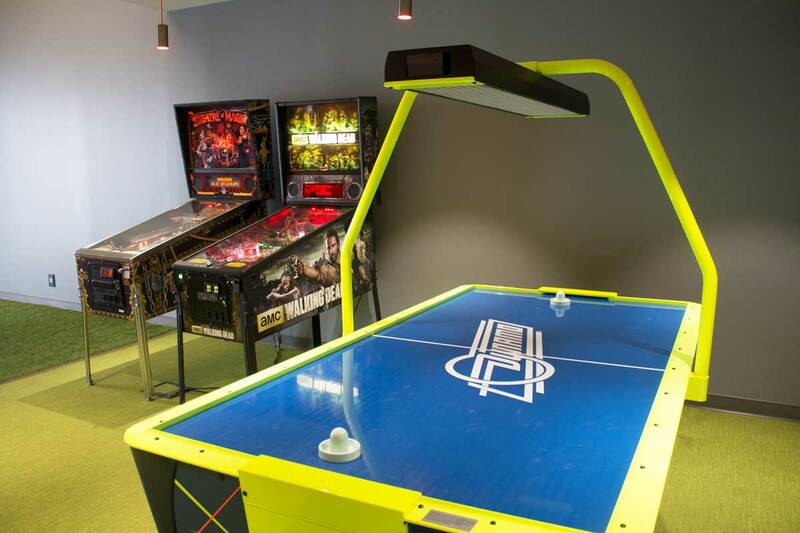 Staff can play the two pinball games and air hockey game beside the slide for free. There’s an antique Theatre of Magic pinball game and a new The Walking Dead pinball game. Photograph by Alana Willerton. Myntex’s sleek kitchen has a small sitting area, which they added real, quarter-inch thick brick walls to. They wanted the area to evoke the feel of a little European cafe and downtown office spaces that have original brick walls. Photograph by Alana Willerton. 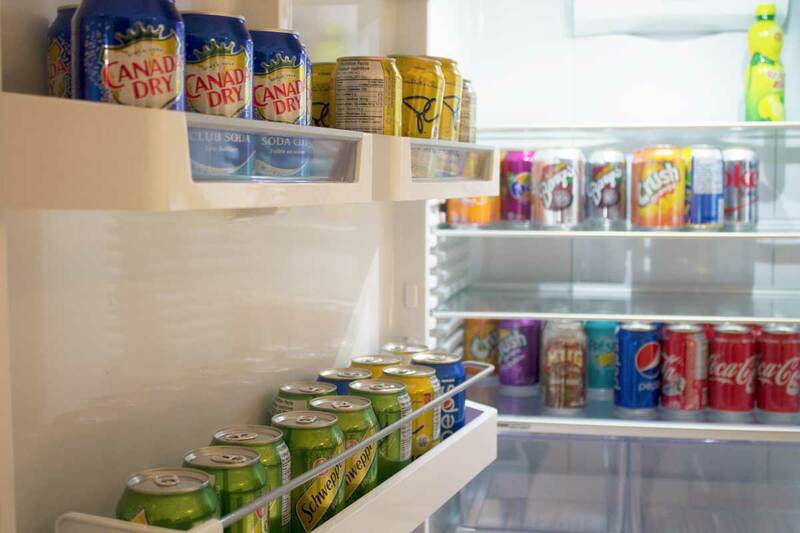 One side of the kitchen fridge has beer, while the other side feature 16 different kinds of pop. Photograph by Alana Willerton. 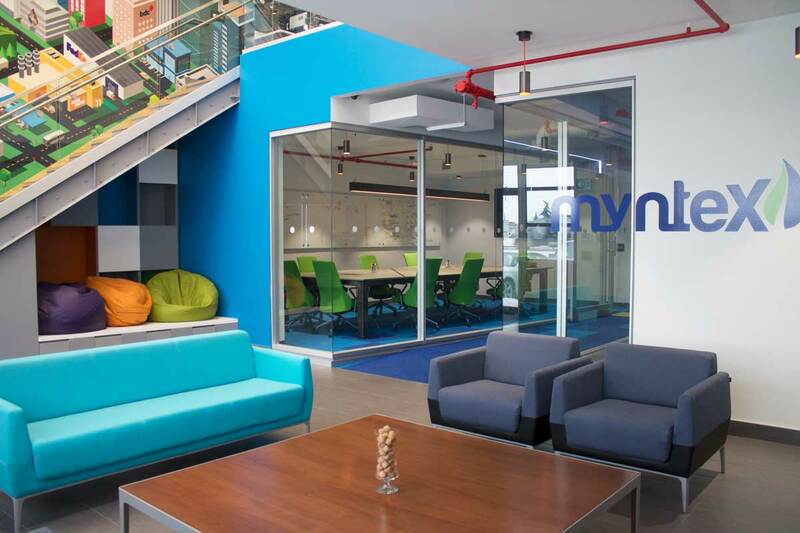 The upper level of Myntex’s office is just as colourful as the lower level. It’s home to the staff’s desks and a second kitchen area stocked with coffee and equipment from Rave Coffee in Canmore. 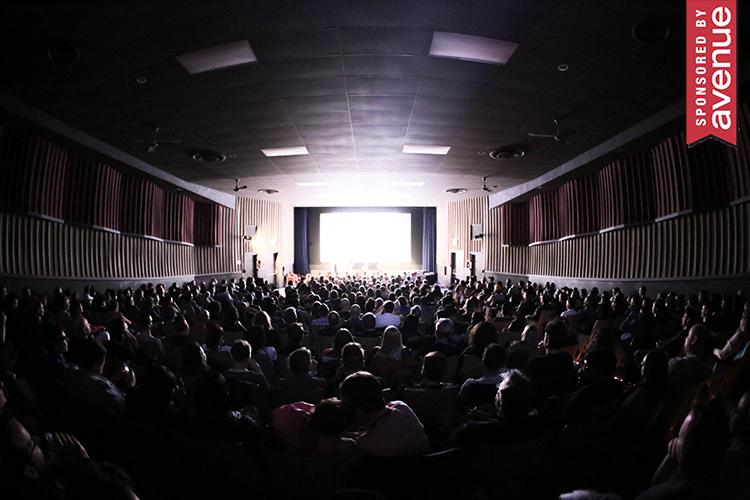 Even the look of the lighting system was thought out. “Up here, we wanted [the lights] to represent a circuit board, so it has different elevations. 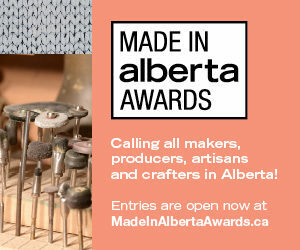 This basically resembles the traces of a circuit board and then moves into kind of a helix design,” Green says. Photograph by Alana Willerton. 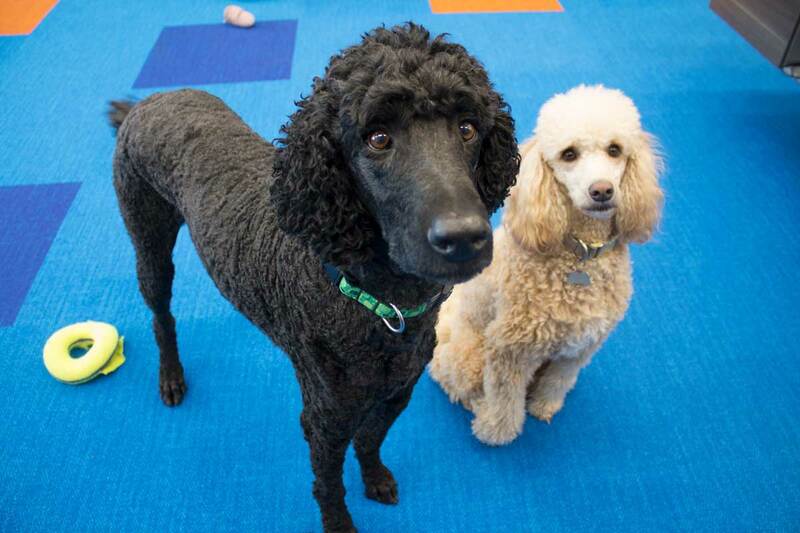 Remi (right) is Green and co-founder/COO Chantel Duplantie’s standard poodle that comes to work with them every day. But they’ve also been fostering dogs like Julio (left) through Standard Poodles in Need. Julio was adopted shortly after our visit. Photograph by Alana Willerton. 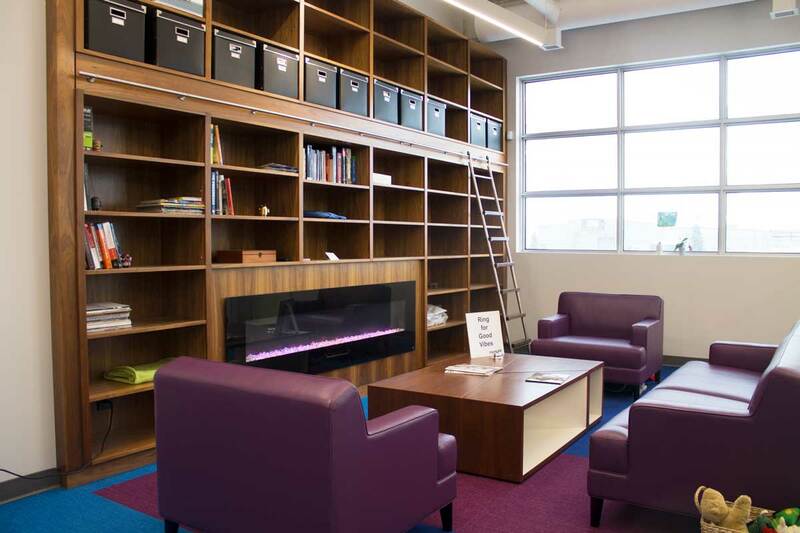 The fireplace area is used for casual meetings, hanging out and pizza breaks. On the coffee table, there’s a bell and a sign that says “Ring for good vibes.” The sign is a tribute to their friend Craig, who used to have a sign like this at the front of his office before he passed away. Photograph by Alana Willerton. 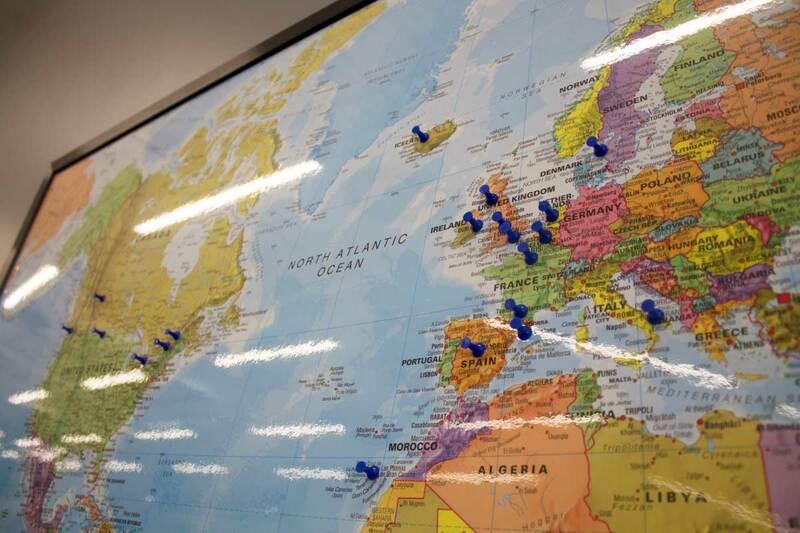 There’s a map on the wall showing the company’s main distribution points, which are largely in Europe right now. Photograph by Alana Willerton. 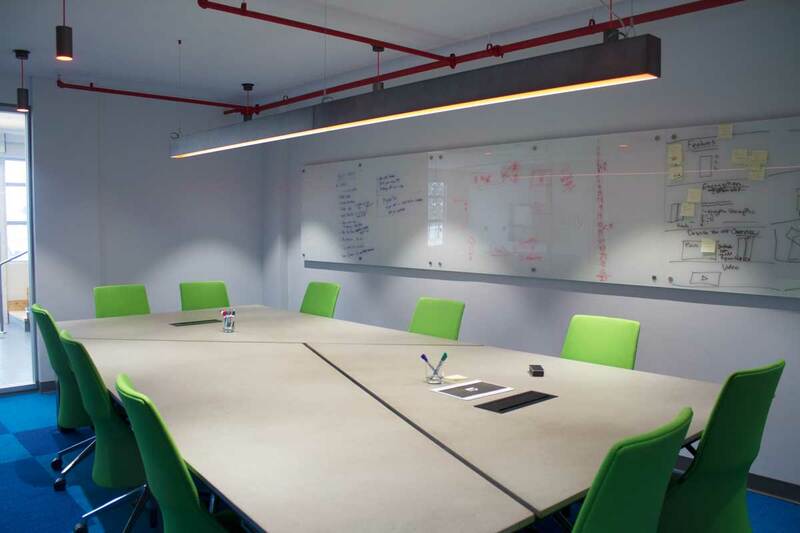 The second floor has a mix of private, soundproof meeting rooms and open work areas. One of the private rooms features real brick while the other features natural reclaimed barn wood. Photograph by Alana Willerton. Another unique feature at Myntex is the three bunk beds and two smaller dog beds on the upper floor. Each bed has a mattress from Black Sheep Mattress Company that varies in firmness. While they can (and have been) used for naps on regular days, the beds do have a specific purpose as well: if a system goes down, system administrators that have signed SLA agreements have to work to fix it. Sometimes this can take awhile, so the beds provide a place where they can rest or take a break. Photograph by Alana Willerton. 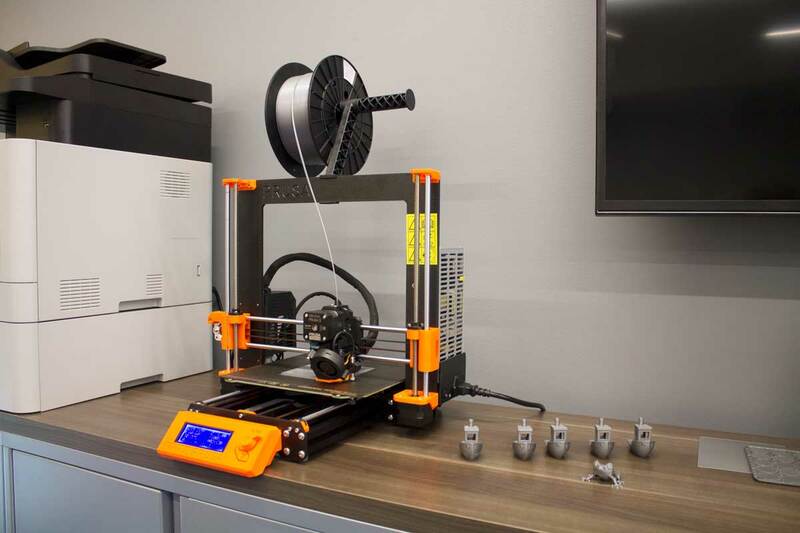 This 3D printer is the new office toy. During our visit, it was making a new mount for Green’s computer. Photograph by Alana Willerton.